Dog Control Orders – or DCOs – are orders that come from the Clean Neighbourhoods & Environment Act 2005. Section 55(1) of this Act gives primary and secondary authorities the powers to make DCOs. As a Parish Council FTC is a secondary authority. This means it’s an offence for the person in charge of a dog to fail to remove the dog’s faeces after the dog has fouled. So bag it and bin it – and remember that any bin will do! Dogs must be kept on leads in designated areas and/or between designated times. This means that authorised officers can request that dogs are put on a leads where they are not under the appropriate control, or where they are causing damage or acting aggressively. This means authorities can stop dogs from entering certain areas. This is commonly used to exclude dogs from children’s play areas, sports courts and dog-free areas in parks. This prevents people walking more than a specified number of dogs at the same time. Following public consultation, we worked with local residents and interested groups to agree the following DCOs for Frome. These Orders came into effect on 23 October 2014. At the present time there are no limits restricting the maximum number of dogs that you can walk at the same time in Frome – but let us know if you think this would be a good idea and if so where. The penalty for committing an offence is a maximum fine of up to £1000 and a criminal record. However, you may be offered the opportunity to pay a Fixed Penalty Notice (FPN) of £80 in place of prosecution. What does all of this actually mean then? Dog walkers can still walk their dogs in most of Frome’s parks and green spaces – but some rules will apply. 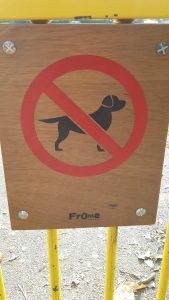 Elsewhere, dogs are not allowed in any of Frome’s children’s play areas. Dogs are equally excluded from the entire Mary Baily playing field (opposite Victoria Park) and the pump track at Welshmill. In other areas – Rodden Meadow for example – dogs can be walked off a lead, but you might be asked to put your dog on a lead of no more than 2m by an authorised officer. This could happen if your dog is not under effective control; is causing a nuisance or is behaving aggressively. Leads can be a maximum length of 2m; so please make sure that you carry one at all times. Lastly, all dog walkers must clear up after their dogs at all times. Not knowing that your dog has fouled and/or not having a bag to clear up with are not reasonable excuses – meaning you could be issued with a FPN or subject to prosecution. So let’s Keep Frome Clean! Help! I still don’t understand how the Orders affect me, even after reading all of this. Is there anyone I can I speak to? Absolutely! Give us a ring on 01373 465757 or call in to the Town Hall. Alternatively email us at info@frometowncouncil.gov.uk and we’ll get back to you as soon as we can.